Young people from all the cadet forces and St John cadets came together on Saturday 15th October at the Royal Military Academy Sandhurst to compete in the 2011 Cadet Forces National and Inter-Services First Aid Competition. Cadets tackled a range of demanding scenarios both as individuals and as teams. In the UK’s largest First Aid Competition for young people 38 teams mainly each of 4 cadets competed in 4 separate national competitions; an event for St John cadets and in a grand finale 7 teams competed for the inter services championships. 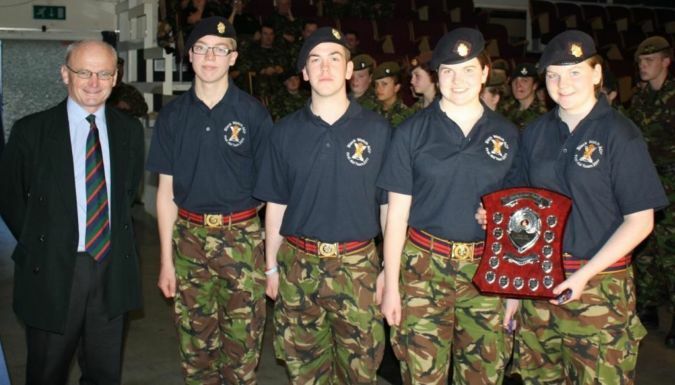 The Combined Cadet Force (CCF) Dollar Academy came through as the cadet champions with the ACF (Yorkshire North & West) victorious in the Young Adult event. In a Scottish double the Black Watch ACF were winners of the ACF Championship and Dollar Academy the triumphant CCF champions. Southern Area sea cadet corps (SCC) took the SCC trophy and in a tie break finish Hertfordshire St John beat Sussex on a tie breaker with the higher team test score. In a remarkable demonstration of personal skills Lance Corporal Robert Henson of Dollar Academy scored an incredible 39 out of 40, closely followed by Colour Sergeant Chris Lusby of Somerset ACF with 38 and Sergeant Stephen Gillison of Merseyside ACF with 37. Best scoring young adult was Sergeant Robyn Tipple of Yorkshire North & West ACF. SI Tipple first competed at Sandhurst as a cadet and also won the Young First Aider of the Year award for saving her mother’s life – dramatic proof of the value of practical training that the competitions provide. Logistical support with feeding and accommodation was provided by Lieutenant Colonel Andy Dawes and staff from Hampshire & IOW ACF. Judges were all external and independent, largely from St John Ambulance with a team from Focus on First Aid. All competing teams provided stewards and some 70 adult staff organised the competition sets, ran the registration and reception team, provided medical cover and most importantly demonstrated superb casualty simulation skills on the 20 or so cadet casualties from Bedfordshire & Cambridgeshire Wing Air Training Corps (ATC), Derbyshire ACF and Somerset ACF. On a brilliant warm and sunny day this huge event with around 140 competitors and 76 staff ran faultlessly and both competitors and staff thoroughly enjoyed the day. Competitors acquired and enhanced in a way not possible in the classroom first aid skills that will save lives.